Is Command &amp; Control Management Inefficient? When most people think of how businesses are organized, they visualize command and control management: the pine tree visual with the leaders at the top. Since we are entering the Western festive season here are some appropriate images to illustrate this. The traditional 'Christmas Tree' pyramid, with senior management at the top and orders cascading down though ever thicker branches is essentially what most of us learn from our schooling: head teacher, deputy head etc...political systems are the same. For this reason most of us assume big businesses are the same as small ones, but scaled up with more people. They're not. Large companies are typically comprised of lots of units. Very simplistically, a large company internally looks more like a snowflake. There is a central management team trapped at the center, and in theory each of their business entities connects up to them. Each business unit feeds into the quarterly earnings focused central leadership and are frequently autonomous to each other. 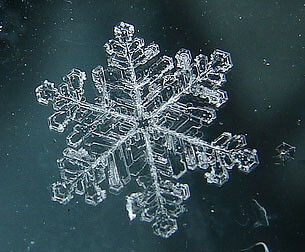 The reality is often a much more misshapen model than the perfect fractal of a snowflake, with the left hand not knowing what the right hand is doing repeated multiple times. A third layer of complexity is the partnership network with supply chains, business process outsourcing and alignment with other businesses on a global level. We are at an unprecedented period historically in terms of cross cultural global business collaboration, and companies are finding themselves grappling with all the issues outlined above across multiple time zones and continents. Those that aren't will soon find themselves in this position if they are to survive. (At a Fujitsu event I spoke at last week in London an attendee mentioned how if two years ago you'd said they would have an office in Costa Rica people would think you'd lost your mind it was so unimaginable: they have one today). The challenge for modern businesses is the time it takes to inform up and down the line of management what is going on, and the relative value of this in getting things done in a timely fashion. There are signs that command and control is breaking down, not least because of the huge pressure on leadership to stay informed in order to make intelligent decisions. Command and control strategic decision making increasingly depends on a complex collaboration matrix that is only as good as the information that populates it: feeding this to the top of the management tree is time consuming and context is often misunderstood in communication. Modern technology - Social CRM, Enterprise 2.0 etc - provides real power in context to workforces, and companies like HCL are empowering their workforce by turning the traditional management pyramid upside down, with the executive team serving their 55,000 employees. What do you think? do you believe time to market and productivity would be enhanced by deprecating command and control management?